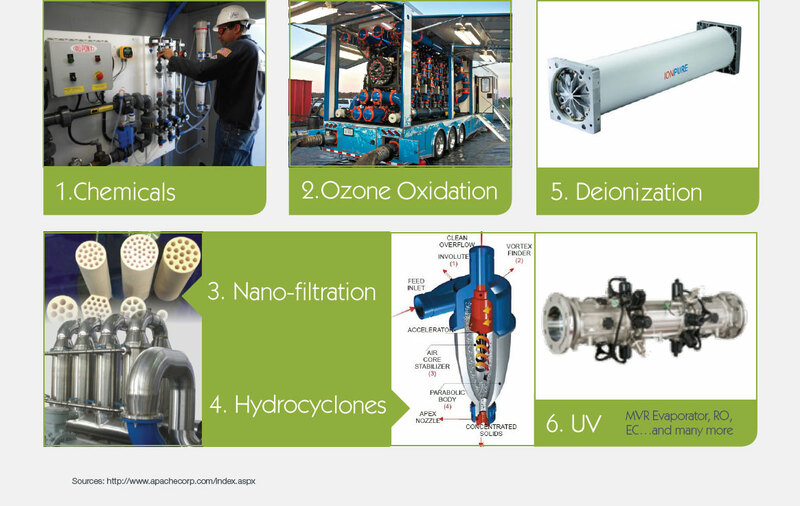 Innovations in water treatment allow companies to use many different types of water in their production activities. The link between hydraulic fracturing and U.S. global leadership in oil and natural gas production is direct: Without fracking, there’d be no American energy renaissance – or the array of benefits it is providing to our economy, to individual households, U.S. manufacturers and other businesses. Modern hydraulic fracturing – fracking has been used commercially for nearly 70 years – is the technological engine behind surging U.S. oil and natural gas output. According to the U.S. Energy Department, up to 95 percent 1 of new wells drilled today are hydraulically fractured, accounting for two-thirds 2 of total U.S. marketed natural gas production and about half 3 of U.S. crude oil production. Modern hydraulic fracturing combined with horizontal drilling allows multiple wells to be drilled from one spot, reducing the size of the drilling area above ground by as much as 90 percent.4 Fracking is the key to unlocking vast U.S. shale resources, freeing up oil and natural gas that previously was inaccessible while protecting groundwater supplies and the environment. America’s shale energy revolution is privately financed and technologically driven. It’s also an economic dynamo; shale natural gas and oil projects in just one region, the Marcellus shale, were responsible for more than 72 million man hours 5 of direct and indirect labor construction hours from 2008 through the first half of 2014. By helping to lower power and materials costs, as well as stimulating economic activity for a variety of businesses like service and supply companies, fracking has supported growth across an economy that has struggled in recent years. Hydraulic fracturing is a modern technology, safely and responsibly developing vast reserves of oil and natural gas from shale and other tight-rock formations. It’s the backbone of an energy renaissance that’s making the U.S. more prosperous and safer in the world today. The combination of industry standards, best practices and effective state and federal regulation is protecting communities and the environment – while making available increasing volumes of cleaner-burning natural gas that is allowing the U.S. to lead the world in reducing carbon emissions from electricity generation. Hydraulic fracturing has been used in the oil and natural gas industry since the 1940s, producing more than 700 trillion cubic feet of natural gas and 15 billion barrels of oil since the practice began.7, 8 Used with modern horizontal drilling technology, fracking has unlocked vast U.S. shale reserves, launching a renaissance in oil and natural gas production, creating millions of jobs and generating economic growth. Without these advanced technologies, we would lose approximately half of our domestic oil and natural gas production, crippling our energy revolution. The U.S. Energy Information Agency (EIA) reports that over 1,300 trillion cubic feet of technically recoverable shale and tight natural gas and 89 billion barrels 9 of technically recoverable shale oil resources currently exist in discovered shale and tight sandstone plays. Responsibly developing these resources creates jobs and fuels our economy. According to EIA estimates, in 2016 the United States was the world’s largest producer of petroleum and natural gas hydrocarbons. For this we can thank hydraulic fracturing. Fracking has unlocked vast reserves of shale and other tight-rock formations to produce an American energy renaissance that has seen a dramatic lowering of oil imports, while shifting America from needing to import natural gas to potentially rank as one of the world’s leading natural gas exporters. As a U.S. State Department official put it: “…the U.S. will be a reliable, market-based supplier to global markets. And that’s not only good for our energy security. It’s good for the energy security of our partners and allies around the world. Elect. Eqpt., Appliance, & Comp. Natural gas access contributed to 1.9 million jobs economy-wide in 2015. Shale gas put an extra $1,337 back in the pocket of the average American family. New natural gas transmission lines meant more than 347,000 jobs, with 60,000 in manufacturing. Total natural gas demand is poised to increase by 40 percent over the next decade. Key drivers will be manufacturing and power generation. U.S. supply is expected to increase by 48 percent over the next decade to meet new demand. Because energy innovation is lowering production costs, IHS expects energy-intensive industries such as chemicals, metals, food and refining to outperform the U.S. economy as a whole through 2025. Shale gas production has created new flow patterns that are causing existing pipelines to reverse flow and will necessitate the construction of new pipeline capacity. With the right policies, strong industry standards and effective state oversight, the job growth and American energy leadership can continue as we safely and responsibly build on the ongoing shale energy revolution. “We did say we did not have evidence of widespread systemic impacts on DW. We did clearly identify that there are potential mechanisms in the water system where impacts could occur, but also opportunities for offsetting those by taking the right preventative measures (right way to construct a well). “ Q&A of the House E&C Hearing. Existing regulations covering well design requirements and hydraulic fracturing operations are specifically formulated to protect groundwater. API’s ongoing workshop series “Commitment to Excellence in Hydraulic Fracturing” is one of the tools that the oil and natural gas industry uses to reinforce with regulators, remind lawmakers and educate the public on industry’s commitment to and leadership on safety, health, and environmental protection. Recently in 2016, an updated version of the workshops included our revised standards related to hydraulic fracturing. This series builds on the original 2011-2012 outreach series, which focused on API’s hydraulic fracturing series of industry guidance documents. The workshop presentations have been archived and are available for the public and others to view. They can be seen on the Hydraulic Fracturing section of API’s website. Safety is a core value of the oil and natural gas industry. Safety has continued to grow since the advent of hydraulic fracturing and horizontal drilling, bringing energy development to more and more areas across the country. Existing industry standards, best practices and existing regulations are minimizing emissions and protecting the health of American families and workers. Standards provide the framework for securing and advancing safety. They guide industry in protecting the personal safety of workers as they deal with task-specific hazards, and they establish process safety measures, covering the equipment, procedures, and training concerned with avoiding major events. Importantly, safety standards also safeguard public health and the environment, ensuring that communities and habitats surrounding industry sites across the country thrive. API has been the industry leader in developing standards since 1924. The API Standards Program is accredited by the American National Standards Institute (ANSI), the same body that accredits programs at several national laboratories, and these standards are developed by the best and brightest technical experts from government, academia, and industry. Working through API’s globally recognized standards program the industry has developed and adopted standards and practices specific to hydraulic fracturing. This includes API Standard 65 Part 2 (overseeing cementing and well construction practices) and API’s Recommended Practice 100-2 (providing proven practices for planning and operating wells, and managing environmental aspects through the life of the well), two of hundreds of API standards and recommended practices cited by several federal agencies and state regulatory bodies. This combination of existing industry standards, best practices and effective state and federal regulation is protecting communities and the environment – while safely making available increasing volumes of cleaner-burning natural gas that is allowing the U.S. to lead the world in natural gas and oil production at the same time that the nation is a global leader in reducing carbon emissions from electricity generation. There are 130 API standards referenced in more than 430 citations by government agencies, including Bureau of Safety and Environmental Enforcement, the U.S. Coast Guard, Environmental Protection Agency, the Federal Trade Commission, the Pipeline and Hazardous Materials Safety Administration and the Occupational Safety and Health Administration. Furthermore, there are 4,130 references in state regulations to more than 240 API standards – the most widely referenced petroleum industry standards used by state regulators. Industry also works closely with STRONGER, a non-profit multi-stakeholder organization that helps states formulate robust environmental regulations associated with oil and natural gas development, based on a detailed review and lessons learned/improvement process. Developing energy from shale (and other tight-rock formations) using hydraulic fracturing and horizontal drilling takes four to eight weeks – from preparing the site for development to production itself – after which the well can be in production up to 40 years.10 A well can be a mile or more deep and thousands of feet below groundwater zones vertically, before gradually turning horizontal. The horizontal portion then can stretch more than 6,000 feet. A single well site can accommodate numerous wells. Steel pipe known as surface casing is cemented into place at the uppermost portion of a well to protect the groundwater. As the well is drilled deeper, additional casing is installed to isolate the formation(s) from which oil or natural gas is to be produced, further protecting groundwater from the producing formations in the well. 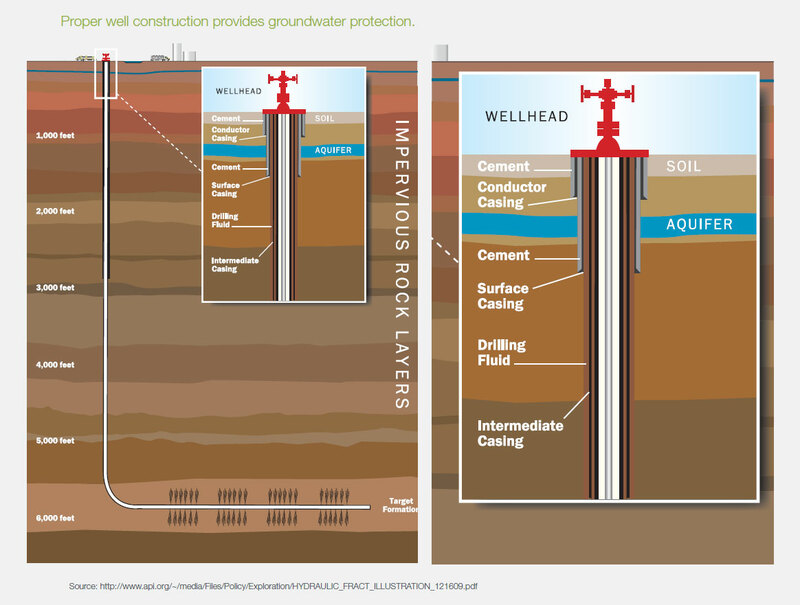 Numerous protective measures are in place at well sites, including liners under well pads, rubber composite mats under rigs, storage tanks with secondary containment measures, and barriers to control any potential runoff. Source: DOE, GWPC: Modern Gas Shale Development in the United States: A Primer (2009). After the wells on a pad are drilled, cased and cemented, a device perforates the horizontal part of the production pipe to make small holes in the casing, exposing the wellbore to the shale. Then a mixture, commonly known as fracking fluid, of water (90 percent), sand (9.5 percent) and chemicals (0.5 percent) is pumped into the well under high pressure to create micro-fractures in the shale and free the natural gas or oil. The sand in fracking fluid keeps the fractures open after the pressure is released, and the chemicals are chiefly agents to reduce friction and prevent corrosion. The FracFocus.org chemical disclosure registry provides information on hydraulic fracturing fluid used in over 117,600 wells. Industry activity is subject to a number of federal and state laws, including the Safe Drinking Water Act, the Clean Water Act, the Clean Air Act and the National Environmental Policy Act. Effective hydraulic fracturing regulation can only be achieved at the state level as state regulations can be tailored to geological and local needs. Key state regulations include: Review and approval of permits; well design, location and spacing; drilling operations; water management and disposal; air emissions; wildlife impacts; surface disturbance; worker health and safety; and inspection and enforcement of day-to-day oil and gas operations. Impacts can be avoided or mitigated with proper practices. Federal regulations provide a broad regulatory foundation for energy development in the United States, including hydraulic fracturing. Key regulations governing shale development include: Clean Water Act; Clean Air Act; Safe Drinking Water Act; National Environmental Policy Act; Resource Conservation and Recovery Act; Emergency Planning and Community Right to Know Act; Endangered Species Act and the Occupational Safety and Health Act. Federal land managers, such as the Bureau of Land Management (BLM), the U.S. Forest Service (USFS), and the U.S. Fish and Wildlife Service (USFWS) have some oversight of oil and gas activities on the lands they manage. This includes conducting environmental impact studies, scientific research to help with management options and decisions, and enforcing environmental protections. The federal government should not use direct or indirect means to limit the innovations that have safely launched an energy revolution in the United States while reducing the environmental impacts of energy production. A typical natural gas well uses 3 million pounds of steel and cement. Each layer of steel casing is cemented in place to create an air-tight seal. Alternating layers of cement and steel casings are designed to ensure well integrity as it passes through groundwater levels thousands of feet down to the energy-holding layers of rock. The industry understands that water is a valuable natural resource and is mindful of the amount of water needed for the hydraulic fracturing process. There are three main categories in which gas and oil companies’ water conservation efforts generally fall; using lower quality water from nontraditional sources, reusing produced water and creating new infrastructure to transport water. Corporate activities can vary widely depending on a variety of factors, including local water stresses, individual business needs and even the particular requirements of specific geologic formations. Innovations in water treatment allow companies to use many different types of water in their production activities. Common sources include surface water, groundwater and municipal water of varying qualities. In addition, companies are diligent about capturing water produced during the exploration and production process, and new water technologies and sophisticated fracturing chemistries help companies make use of this water more frequently as well. Between 2010 and 2015 in Pennsylvania alone, wastewater reuse increased from 2.6 to over 22 million bbl/yr. 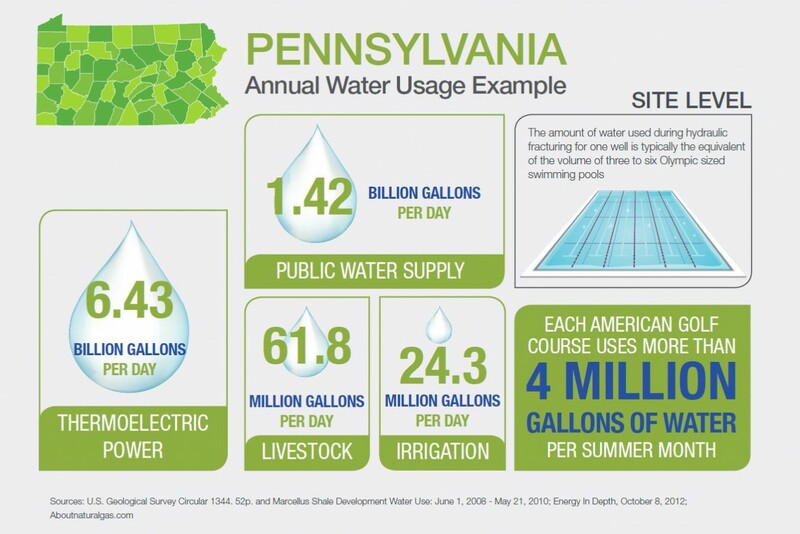 Since 2010, Pennsylvania’s wastewater recycling increased from 4.6 to over 7.8 million bbl/yr. According to the Penn State Marcellus Center for Outreach and Research, during the first half of 2013 in the Marcellus shale play, 90 percent of the more than 14 million barrels of produced fluids from fracturing was reused.12 That represents a significant savings in the amount of new water needed for hydraulic fracturing elsewhere, and illustrates the industry’s focus on environmental issues and efforts to reduce the impacts of energy development on resources and communities. Thanks to increased use of natural gas, U.S. energy related emissions of CO2 from power generation are at their lowest point in nearly 30 years.13 The environmental benefits associated with natural gas go well beyond CO2 reductions. Greater use of natural gas in power generation will also reduce NOx, SO2, PM, acid gasses, Hg and non-Hg heavy metal emissions. While natural gas production has risen, methane emissions have actually declined slightly thanks to the oil and natural gas industry’s investment in new technologies. Recent EPA data shows that industry initiatives to capture methane are effective. The EPA’s annual draft inventory of U.S. greenhouse gas emissions report released in April shows that methane emissions from all petroleum systems decreased by over 28 percent since 1990 – including a decrease of emissions from petroleum production of around 8 percent from 2014 levels. EPA attributed this improvement to reductions in emissions from associated gas venting and flaring. Seismicity Associated with Wastewater Disposal Wells. Advanced hydraulic fracturing and horizontal drilling are the technology engines driving America’s ongoing energy renaissance – surging oil and natural gas production that ranks first in the world. This oil and natural gas production, enabled by hydraulic fracturing, strengthen U.S. energy security, boost the economy and lower consumer energy costs. In addition, the increased use of cleaner-burning natural gas is the main reason U.S. greenhouse gas emissions from electricity generation are at their lowest level in nearly 30 years.19 For decades hydraulic fracturing has been used safely – thanks to proven engineering, effective industry risk management practices and standards as well as federal and state regulations. Industry takes seriously earthquake incidents that may be associated with the disposal of produced water from energy development – salty brines and other fluids that come to the surface during oil and natural gas production. On average, about 10 barrels of brine are produced with each barrel of crude oil.20 Once separated from the oil, brine typically is returned to the underground formation it came from (or a similar formation) via disposal wells managed under EPA Class II Underground Injection Control (UIC) regulations. In the U.S. there are roughly 35,000 active Class II wells 21 used to dispose of these fluids that are a byproduct of oil and natural gas production. These are a subset of more than 800,000 permitted UIC wells nationwide that serve the needs of many different industries and governmental entities.22 The majority of disposal wells in the United States do not pose a hazard for induced seismicity, but under some geologic and reservoir conditions a limited number of injection wells have been determined to be responsible for induced earthquakes with felt levels of ground shaking. (Hydraulic fracturing itself is not the issue here. It is understood that certain unique and limited geologic conditions combined with hydraulic fracturing may induce an earthquake felt at the surface of the earth but such events have been rare.) To evaluate the need for mitigation and management of the risk of induced seismic events, it is important to understand the science. Documented since at least the 1920s, induced seismicity also has been attributed to a number of other human activities, including impoundment of large reservoirs behind dams, geothermal projects, mining extraction, construction and underground nuclear tests. In that context, the science of seismicity should be understood when discussing quake mitigation measures and/or risk management. Induced seismicity may occur when a geological fault is present and under stress. Increased pressure from fluid injection may unclamp the fault and allow slippage, resulting in surface shaking. BOTTOM LINE: Induced seismicity is a complex issue, and the knowledge base surrounding it is rapidly changing. A one-size- fits-all approach isn’t practical because of the significant differences in local geology and surface conditions – population, building conditions, infrastructure, critical facilities and seismic monitoring capabilities. As such, state regulators are best positioned to address potential issues linked to oil and gas injection wells in their state. States are developing diverse strategies for avoiding, mitigating and responding to potential risks as they locate, permit and monitor Class II disposal wells. Many state regulators work with experts from government agencies, universities private consultants and industry experts on these issues. Effective planning involves identifying where there’s risk of harm from a seismic event because people and property are located nearby. Again, state regulators are best able to make these assessments and plan adaptive responses in the event of a quake, such as adding seismic monitoring, adjusting injection rates and pressures, suspending injection well operations or halting injection altogether and shutting in a well. Both hydraulic fracturing and the underground disposal of produced waters from oil and natural gas operations have proven safe and environmentally reliable. Industry, academia, and government entities are clearly committed to pursuing further research to better understand the complex science and physical mechanisms associated with induced quaking events. Our companies are committed to science-based measures to reduce risk. It’s an integral part of making energy development as safe as possible. America’s shale energy revolution is built on innovation that produced advanced hydraulic fracturing and horizontal drilling technologies and techniques. And that innovation continues, working on ways to make fracking even safer for the surrounding environment and communities. 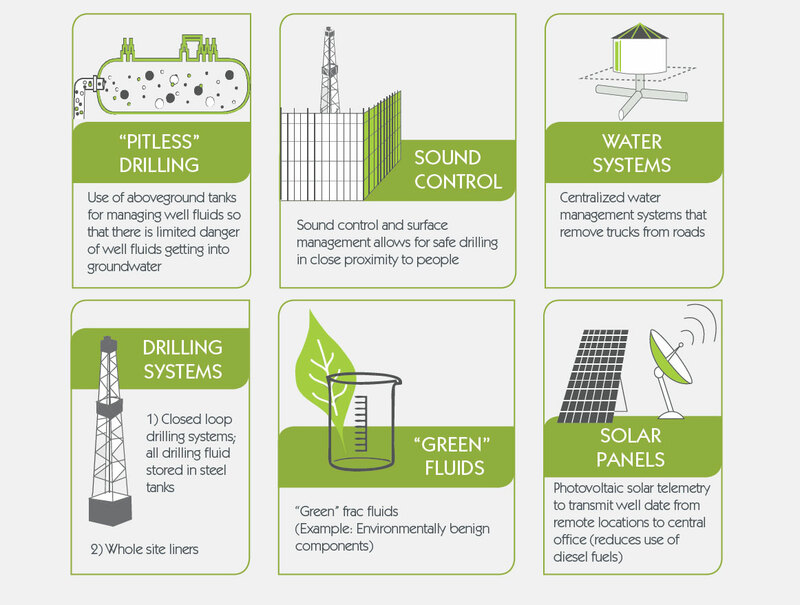 Safe and responsible drilling means site management – from multi-layer surface liners that protect the entire drilling area to closed-loop systems to maintain control of drilling fluids. Safe operating practices and water management are just two areas for which API has developed standards to protect the environment. 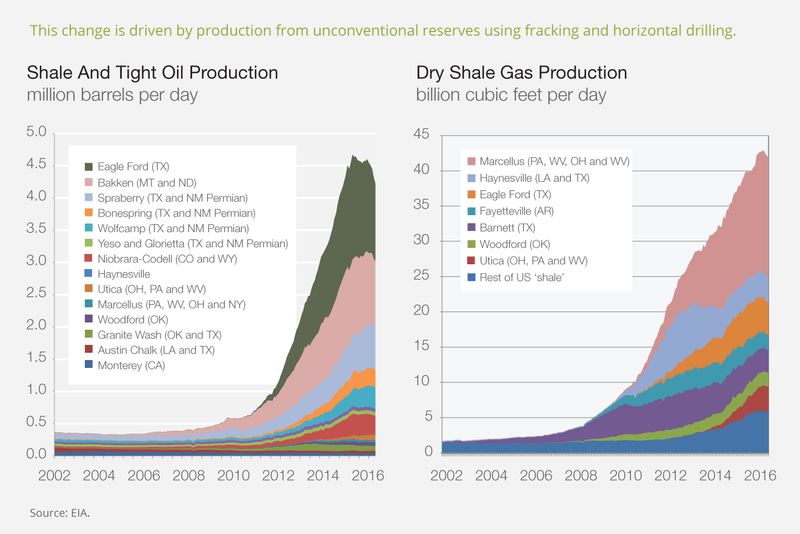 The shale energy surge also is spurring innovation: waterless hydraulic fracturing fluid, methods to decontaminate and recycle water used in fracking and more.